It’s time to host a dinner party but you dread the work it takes to bring out hot food to every single guest. It’s not quite the enjoyable evening that you’d like to have if you have to keep running back and forth between the kitchen and table. That’s why with the help of the best buffet server and warming tray you can cook the food, place it all in servers that are kept at a constant low temperature so that the food is kept warm throughout the party. Anyone can eat at any time and they won’t have to eat anything that has turned cold because it has been sitting out for too long. The most practical kind of buffet server for home use is an electric one because it’s safe to use anywhere. Buffet food warmers usually come with 2 or 3 serving dishes in a row, each with their own lids. They sit on a base that’s plugged in and heated and when the party is over, they are removable from the base for easy cleaning. The base doubles as a warming tray that can be used separately if you only have an hors deouvres party and need to keep the canapes warm. If you prefer to use your own serving dishes, then consider getting just an electric warming tray, which will cost less and take up less storage space. Just ensure that the electric cord is long enough to reach whichever plug point you intend to use. While you want to have individual buffet pans that are big enough to hold an adequate amount of food, the entire buffet server with warming tray should be compact enough that it doesn’t take up all the space on the table. It’s best if you have the ability to set the desired temperature of the buffet server using a dial. A few warming trays for buffets are powerful enough to allow you to reheat food straight from the fridge and the keep it warm once it has reached a safe to eat temperature. An indicator light to let you know when the power is on is useful. While the warming tray is best for keeping hot canapes warm and fresh throughout, some models feature a tray that can also be used to make breakfast items like pancakes, so it’s not just an appliance that gets used for parties. Now that you know what kind of warming plates for buffets you can get on the market, let’s take a look at the ones that are most highly rated by customers. These food warmers for parties are lifesavers! The Oster CKSTBSTW00 is a warming tray that comes with three separate serving pans, which makes it more than adequate to host or entertain your friends. Each of the pans are made from a durable, stainless steel material that will retain the heat and help keep your dishes warm for a longer period of time. Each one holds 2.5 quarts of food, which is adequate for large family gatherings. It will not be able to heat your food, but it can keep it warm for as long as you need. An added benefit is that the buffet pans are oven-safe, so you can cook a dish in the oven and transfer it straight away to the buffet server to keep warm. No need to use extra baking pans! The base of the serving tray, which is 20 inches by 13 inches, also doubles as a stand-alone warmer that can be used for side dishes or smaller items that need to be kept warm. The lids are designed in the shape of a dome, which helps to keep the heat and the moisture inside the dish. The lid also has indented handles that make it easy to grab. The handles on the actual warmer feature a stay cool design as well so that you do not burn yourself. This buffet server utilizes 300 watts of power, and it has a high and low setting so that you can adjust the heat. Unfortunately, there is not an on and off switch, so if you need to turn off the heat, simply unplug the three-foot power cord. There is a large power indicator on the front of the device, so you can easily see when it is powered on. 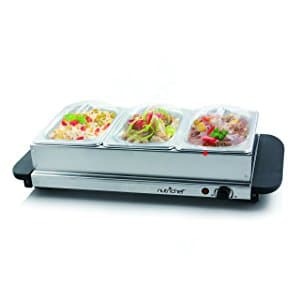 Next, we will be looking at the NutriChef Food Warmer and Buffet Server. It is an appliance that is designed to serve two purposes. The first utilizes the stainless steel base, which serves as a hot plate that can be used to reheat your dry food items. The best part is that this stainless steel material gives you a professional look that is easy to clean. It has a maximum temperature of 175 degrees, so it is not going to quickly sear your steak tips or crisp your chicken, but it can be used to saute veggies, cook breakfast or fry up some burgers or chicken tenders quickly. The second part of this device is the buffet warmer, which is separated into three trays that hold 3.5 quarts total. This is more than enough space to feed a large family; in fact, the tray is about 25 inches by 15 inches and can easily hold one large pan of your own if you don’t want to use the 3 pans that this model comes with. The lids are clear so that you can see into the warmer to make sure that the food is not drying out too much under the heat. In addition, the lid has an indented top so that you can lift the lid off with ease. If you want to adjust the heat of the warmer, there is a knob on the right side of the base that lets you go progressively from a low to high temperature and back. Unfortunately, there is not a power switch with this model, so if you need to determine whether the heating element is on, there is a red indicator light. The Elite Platinum EWM-9933 is a stainless steel buffet tray that can be broken down into three different functional units of food warmers for parties. The first is the base, which is 25 inches by 14.5 inches. It can be used as a warming tray if you’d like; in fact, it is perfect for keeping finger foods warm for your guests. The second aspect of the device is the large stainless steel pan that is able to hold 7.5 quarts of food. It is an oven-safe container, and it has silicone handles to protect your hands from the heat. The base also has the same type of handles, which gives you an easy way to carry the entire warmer. The last part of the device are the three stainless steel individual 2.5 quart buffet trays. These sit inside the larger pan and you can insert one, two or all three of the trays into the pan. For example, you can insert one buffet tray filled with a side dish into one end of the pan, and fill the rest of the pan with a main dish. You set the entire pan on the warming tray. This way, you have 2.5 quarts of one dish and 5 quarts of another dish kept nice and warm. The buffet tray lids are plastic and shaped like a dome, and there are little slits in the lids so that you have a place to put your spoons. Insofar as power, using 200 watts of energy, you can adjust the temperature with the small knob on the front of the warmer. It has an off, a low, a medium, and a high setting that you can use, and when the device is turned on, there is an indicator light next to the control knob. One of the biggest issues with the Elite Platinum EWM-9933 is that the power cord is only about two feet long, which makes it difficult to reach an outlet sometimes, especially if you are trying to cater for a larger group of people and your dining table cannot be placed close to a power outlet. While the large serving pan can go in an oven up to 350 degrees, the individual buffet trays are not oven-proof. Betty Crocker is a name that is familiar to most kitchens, and the Betty Crocker buffet server is a stainless steel warming tray that is perfect for your hosting needs. It is a 3 section warming tray, each with a 2.5 quart capacity, which is why it is the perfect size for most family gatherings. The bottom portion of the device or the warming tray is about 27.09 by 16.34 inches. There is also a 2 tray server available if you want a more compact unit. Unfortunately, these pans are not designed to cook your food, so they are not oven safe. However, they are dishwasher safe, which makes them really simple to clean. The plastic lids are designed to be see-through so that you can see how much food is left in the tray. These lids are designed with a slot for the spoon so that you can conveniently keep the spoons in the trays. The handles on the lid and the warmer are cool to the touch to prevent burns from occurring, and there is even a way to stand the lids upright by the side of the trays so that they can simply be lifted from the food rather than completely removed. On the front of the warmer, there is a red indicator light to let you know when the device is in use, and there is a temperature control knob directly next to the indicator, which has the following settings: OFF, Low, Medium and High. If you are looking for a buffet server and warming tray for a smaller crowd or for use as a fondue server, dip warmer, etc., then the Ovente 3-in-1 is a great option to consider. It consists of a stainless steel base that can be used to warm small appetizers, or you can use the unit as a buffet server that has three small serving pans that are about one liter a piece. The warmer is designed with cool to the touch handles that makes it easy to pick up, and the lids are see-through so that you can tell when your food needs to be refilled. They are also designed with a dome-like shape to help keep the heat in, and the handles on the lids are indented a bit to make them easy to lift. This warmer uses 200 watts of power to keep things warm, and there is also an indicator light for your convenience. There is a temperature knob that you can use to maintain the heat; in fact, it even has an off power setting so that you know that the power is fully off. When it comes to cleanup, this is a very easy buffet server to clean; in fact, it is dishwasher safe, so you don’t actually have to use your muscles to get it clean. If you’re more interested in a small crock pot warming server to use only for dips and fondues, we have a selection of those too.